Bandon Dunes Golf Course was the first course built on the incredible property that is Bandon Dunes Golf Resort. 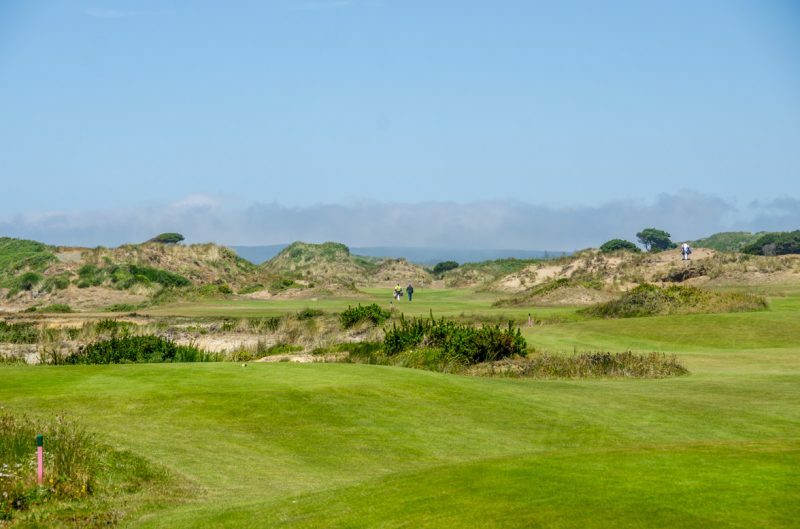 Bandon Dunes first offered up its challenge to golfers in 1999 and was designed by Scottish golf course architect David McLay Kidd. Brilliant idea having a Scottish designer work his magic on land which is quite similar to Scotland complete with ocean views, mild temperatures, wind, and even gorse. I’m sure Kidd felt right at home. Bandon Dunes is located about five hours southwest of Portland, Oregon, on the Oregon shoreline. Getting there is easiest via the airport in North Bend, a mere 40 minute drive. North Bend is likely not the cheapest option. One can typically fly into Portland for a fraction of the cost to North Bend, but then have to deal with the five hour drive. It’s quite scenic and goes by quickly though. David McLay Kidd’s design smoothly winds its way over the natural sand dunes with scenic overlooks, thrilling elevation changes, and a natural flow which is often overlooking the Pacific Ocean. Having played many of the great seaside courses in Scotland, the visual and stylistic similarities are stunning to me. Scotty could have beamed me to Kingsbarns Golf Links or Cruden Bay Golf Club from Bandon Dunes and I might have had a hard time telling the difference. Bandon Dunes even has some riveted bunkers. Riveted bunkers have steep walls which are made up of layers of sod, popular in the UK. Seven of the 18 holes are waterside, ether running by it, ending up by it, or starting by it. Tee shots at Bandon Dunes are challenging, interesting, and present the golfer with numerous options. All this while giving the golfer stellar surroundings and vantage points of the beautiful terrain as well as the Pacific Ocean. Different tee boxes not only change the yardages of the holes, they change the tee elevation and angles to the targets. I’m a big fan of variances like this, rather than having three sets of tees on one 30 yard flat rectangle of grass. This isn’t the local muni. There are many situations which the tee shot is forced to carry over natural arroyos, canyons, or native sand areas. Nothing too extreme or unplayable from the proper tees, but challenging enough to get in a golfer’s mind and penalize a bad tee shot. Most fairways at Bandon Dunes are fairly wide and not overly difficult to hit, barring the 30mph winds I played in. The sloping and curvature of the fairways is smooth and natural, and can on occasion produce uneven lies. Errant tee shots will find some strategically placed, but not overly extreme bunkering or perhaps native dunes or washes. There are a few fairways which are split or give the golfer different options like the 16th hole above. The golfer could layup short of the dunes dissecting the fairway, or try to blow a driver over the dunes favoring left. I chose latter, which I was successful in doing. But with the extreme tailwind I had, my drive went so far it went by the green, past the next tee box and off a cliff never to be found again. Strategy! The putting surfaces at Bandon Dunes are quite enjoyable and manageable. They’re an oasis amongst the ruggedness of the dunes. Natural sloping gives the golfer a chance to be creative when putting, or chipping. 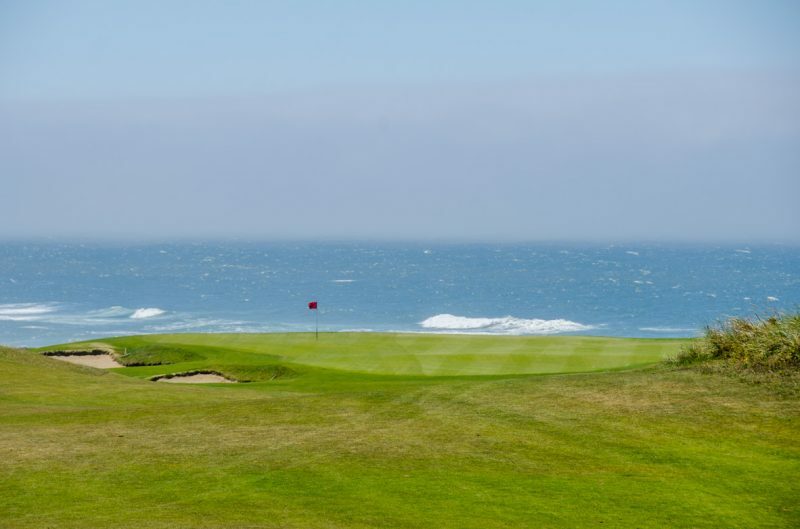 I found putting on the smooth surfaces at Bandon Dunes to be challenging enough for me to keep my focus to insure a one or two-putt, but not so crazy that I’d introduce 3-jacking or more by making small mistakes. I appreciated that the green complexes offer a chance to putt from off the green and not force the golfer into a high shot unless there was a bunker or native area to carry. I’m happy to offer a little advice for playing Bandon Dunes. First off this is a walking-only course. No carts (or buggies for you in the UK). Be ready for some solid walking on hard ground, and some minor elevation changes. Get a caddie to help you navigate the course, or snag a pull/push cart from the starter to make the walk a little easier and less tough on the back. If your ball manages to find a gorse bush, let it go. Seriously. It’s not worth it. Have your wind game ready. Have your apparel game ready as well. Bring a sweater and some waterproof outerwear. The temperatures are mild all year, with the high temperatures reaching the 60’s in the summer. Bring your camera and make sure your battery is fully charged. You’ll be glad you did when you’re at home looking back at the tremendous golf course and wonderful experience you enjoyed. Bandon Dunes starts and ends at the main lodge, where one can find numerous dining and lodging options and a finely stocked pro shop. A short shuttle ride away are the other Bandon Dunes courses, more lodging, and some of the best practice facilities in the world. Bandon Dunes is a stellar and challenging golf experience. I appreciate playing the course more and more as I think back about each hole through my dozens of photos. 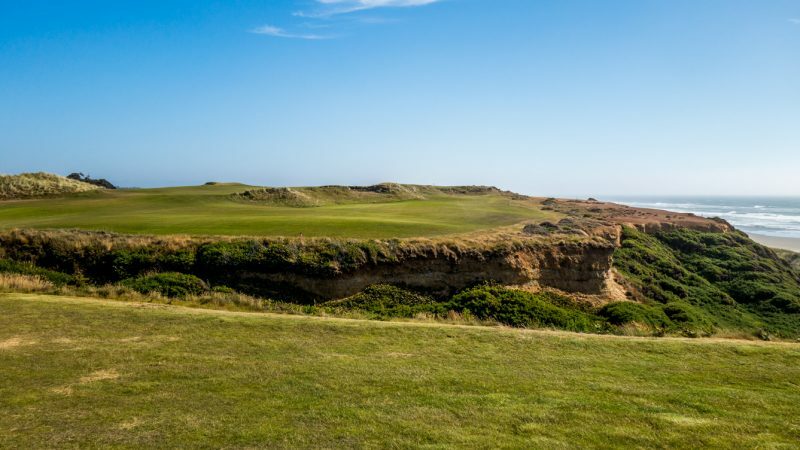 This is the course that started it all at Bandon Dunes Golf Resort. It’s a fantastic foundation which the resort has built upon and staked its claim as the #1 golf resort in America. 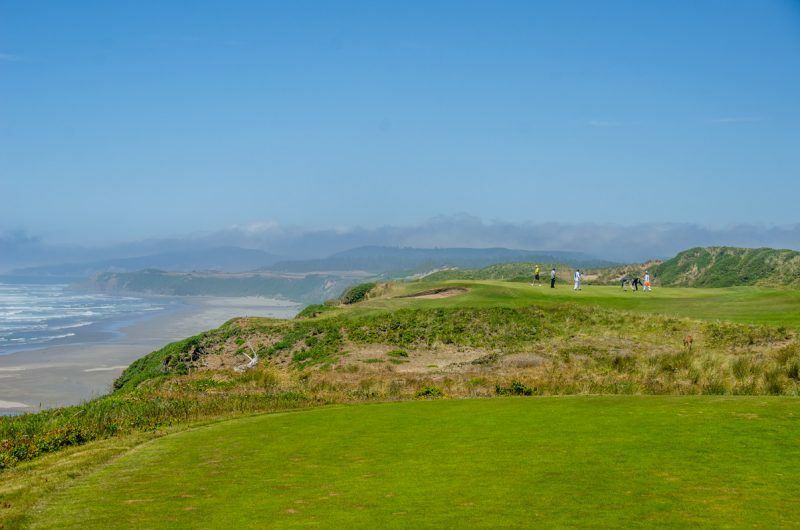 Visit the HOG Bandon Dunes photo gallery. 13-hole par-3 Bandon Preserve course review.